You are here: Home / Internets / Why the Christian fixation on Haters? In the past month, two big-time evangelicals on twitter have referenced “haters” when it comes to dealing with online folks. Once is a phrase. Twice is a pattern. Why is this? Grieving is hard. Grieving as public figures, harder. Grieving while haters celebrate your pain, hardest. Your notes sustained us, thank you. Understandable. I read some of it, and it was awful stuff. Although there were also people pointing out difficult truths…but it wasn’t the right time to do so. So hate = bad bad stuff for our first example of Rick Warren. The second example was much more personal…because it was about me. Jon Acuff is the blogger for the popular Stuff Christians Like page that became his own named website. Very hilarious guy, regular tweeter. In fact, he live-tweeted every episode of The Bible TV show recently on the History Channel. 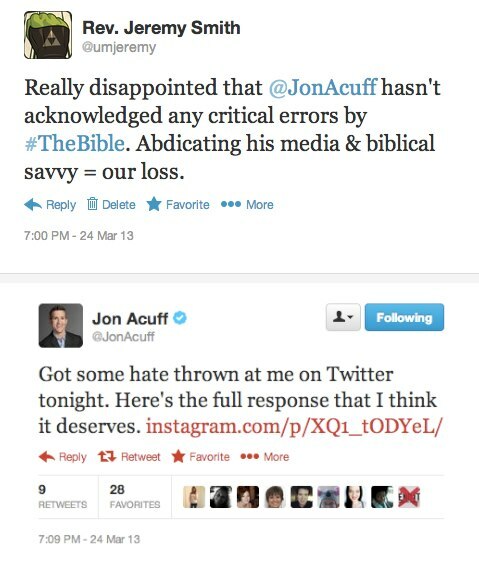 I was also live-tweeting it and saw that while I was being snarky and pointing out errors that I thought violated the biblical account, Acuff never once questioned or even referenced the series’s adaptions of the biblical text or the outright errors made on it. So I called him on it and asked him to contribute an assessment of the series’ inaccuracies (which I would think an evangelical would be bigger on biblical literal interpretation than progressives). So here’s our exchange (the instagram link he posted is here and no, he sent no other tweets in the interim nor did I see anyone else that he would be referencing). Acuff has called out “haters” on his blog before. From this post, haters are people who pick at inadequacies and point out insufficiencies. From this post, haters are random strangers who don’t matter to your life and are not trying to make you better. From this post, haters only matter if they comment on something that really matters to you. From this post, haters are sheep and you are a tiger and thus haters have no redeeming value…ever. From this post, haters are only paid attention to when you look for it. Those are all good reads, but in none of them does Acuff really define how to differentiate between hate and critique. So I have no idea if I fall under his rubric or why my question–combative as it was, I was honestly asking why he glossed over all the errors when he points out errors in media and bible depictions all the time–qualified as “hate” to him. It could be that Acuff is drawing attention to his new eBook “Haters.” Maybe he’ll have a definition in there. Maybe my request (even if strongly-worded) falls under the term haters. I’m not really willing to pay $15 to find out. But I do wonder…as Christians become bigger voices and larger personalities, does their ability to distinguish between hate and critique becomes more callous. If Acuff and I were both Christian leaders in a small town, critique would be more personal even if I just showed up on his doorstep sans relationship with the comments. We both share the same ministry area. But online, our shared Christian ministry as fellow believers in Christ and perpetuators of His word is less obvious, maybe even not acknowledged by both parties. Maybe we aren’t even on the same plane. I’m a mere local church pastor that has a blog. I have, currently, 2,200 twitter followers whereas Acuff has 152,000. 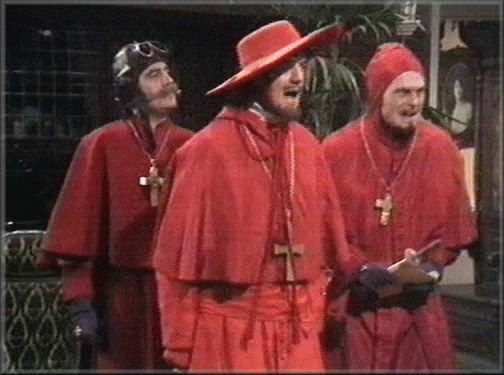 We have very little in common other that our shared interest in Christianity and media. But just like I share my title “pastor” with Joel Osteen, Fred Phelps, and the other pastors in my city, everything a fellow pastor does reflects on me. Everything a fellow Christian says on cable news reflects on me. Every cashier that I am short with while wearing a clerical collar affects their relationship to clergy in the future. We are all connected…and I wonder if the more people we get connected to, the less connected we are to our shared status with one another and the easier it is to lump groups of people together who do not share the same heart. Prayers for the haters, and for Warren, for Acuff, and for all those who struggle with being in the spotlight and what it means to those of us on the margins. Thoughts? How would you define “haters?” And what makes them different from folks–even strangers–that offer critiques? Two big problems with communication on the internet, and especially twitter, are the difficulty communicating through the media, and anonymity. Anonymity means that there are fewer (or no) consequences for saying whatever you like, and no reason to filter your thoughts or present yourself positively. Written communication also means we lose out on non-verbal cues such as inflection, expression, and body language which are so vital in conveying meaning in face-to-face conversation. Twitter makes this harded, by forcing you to keep what you’re saying as short as possible. People sharing themselves on the internet open themselves up to lots of criticism and abuse because of consequence-free anonymity (as Rick Warren has received), and have to develop stronger defenses. This might make some, like Acuff, more expectant of criticism, and consequently more likely to read a neutrally worded question as criticism, rather than as a genuine critique or positive questioning, and more likely to dismiss others as haters. I would not define haters. I would contend that “haters” is a category created to dismiss people. Using “haters” demeans a person in conversation with you and abdicates any personal reflection on what a person is saying. If someone was going out of there way to upset you and not pursue conversation then I would use the word troll. Someone challenging you or critiquing you is not necessarily trolling. Sadly, it seems that in our present culture it is easier and socially acceptable to call people names rather than to honestly address concerns. Listen to almost any “news” or commentator on Fox network and you will hear that same approach to any disagreement or question. My way or the highway seems to have become the motto of many.